Tip Tuesday!! Are you ready for snow shoveling season? As mid Michigan braces for another “Michigan” winter, Paramount Rehabilitation Services would like to offer tips on how to properly shovel snow to decrease risk of injury. Shoveling snow can be hard on the back if proper body mechanics and equipment are not used. Using proper body mechanics and the right shovel can go a long way toward preventing a low back injury such as muscle strain or a herniated disc. Don’t just go outside into that brisk Michigan winter weather and not expect your body to tighten up. Do a five to ten minute warm-up before heading outside. This could include simple marching in place and doing forward bend stretches to limber up your back. The next step is to select the proper shovel. Look for a shovel with a longer handle or a curved handle to minimize painful bending. To use the shovel correctly bend your knees and do not bend from your back. 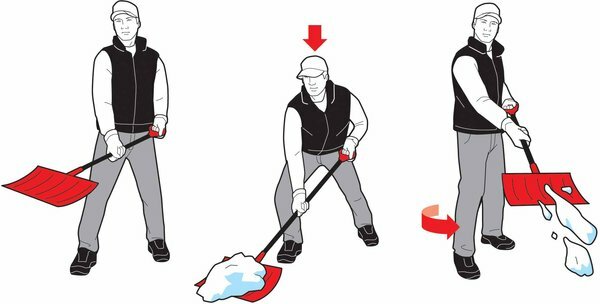 Lift smaller loads of snow and avoid twisting, because the back is not made to bend and twist all in one motion. Take frequent breaks while shoveling to stretch out your back. Stand up tall and slightly extend your back backwards to stretch all the muscle you were using to bend forward. Hold the stretch 15-20 seconds and repeat 3-5 times. Through these helpful tips you should be able to avoid having a painful low back after battling the snow fall. If you or someone you know develops low back pain, consult your physician about a referral to Paramount Rehabilitation Services.